Bullet is the modern physics engine that the OpenSim development team are heading towards during the version 8.x builds of OpenSim. Although it’s only bullet version 3.x it provided a more robust collision detection for regions to make them feel more like the Second Life regions. It is uncertain of Bullet development will continue with the introduction of AviNations code-merge of their updated ODE Physics which allow for better prim sitting and vehicle crossing from region to region. Currently, although you can follow all of the steps and compile bullet onto your Arm based Pi. Bullet simple does not run and you must run Bullet in XNA mode which isn’t optimal. ;; OpenDynamicsEngine was the previous default physics engine in OpenSimulator 0.7.6.1 and before. ;; It continues to provide a workable physics implementation. ODE does not currently support varregions. ;; basicphysics effectively does not model physics at all, making all objects phantom. 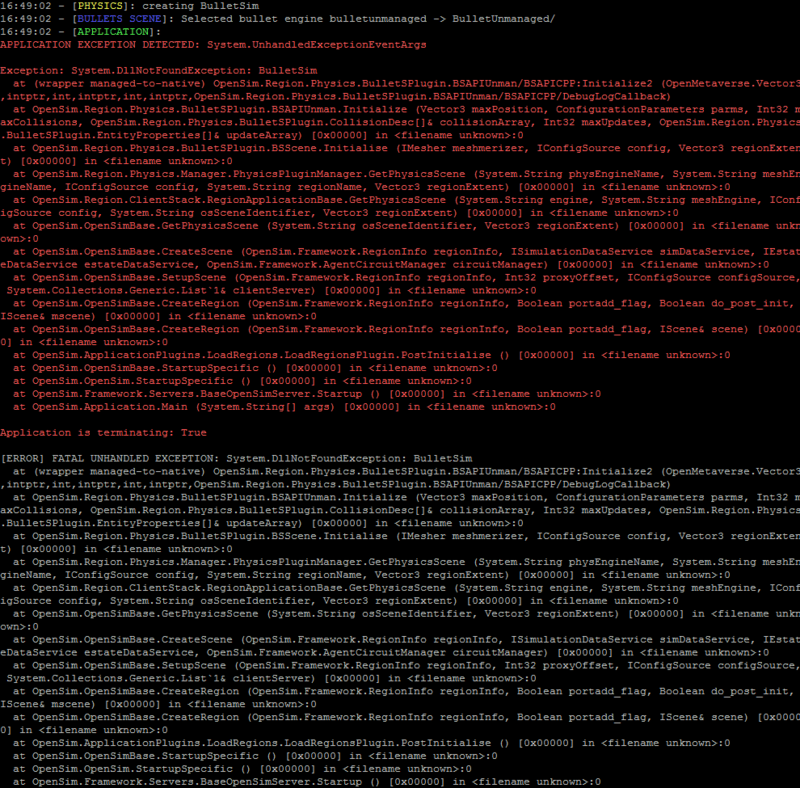 FATAL UNHANDLED EXCEPTION: System.DllNotFoundException: BulletSim errors! As of OpenSim version 0.8.x and beyond the new physics standard is now “Bullet” and ODE or “OpenDynamicsEngine” physics has been demoted to a backup. Open your /bin/OpenSim.ini file and add this to the bottom of your file. What this will do is you are telling the Mono engine to handle Bullet physics via XNA instead of relying on the Linux libraries to handle the data back and forth. The results for prims and avatars is very good! However, users may encounter issues with mesh objects especially if the collision data is either lacking or not a perfect hull such as a ‘box’. The advantage is you now have bullet physics just like everyone else running OpenSim 0.8.x! Yay! The downside of bulletXNA is it eats up a lot more processor power as your relying on the mono engine to do all of the heavy lifting for you. Compiling bullet underneath debian wheezy was virtually impossible generating tons and tons of hard-crash errors as described by this blog. However, with the introduction of Debian Jessie on newer model of Pi’s compiling bullet 3.x onto the ARM processor not only compiles with no errors, but is also stable for OpenSim usage now too. cmake .. -G "Unix Makefiles" -DBUILD_EXTRAS=ON -DBUILD_DEMOS=OFF -DBUILD_SHARED_LIBS=OFF -DINSTALL_LIBS=ON -DINSTALL_EXTRA_LIBS=ON -DCMAKE_BUILD_TYPE=Release -DCMAKE_CXX_FLAGS="-fPIC"
Note: This has now been updated from the old 2.82 bullet code to bullet 3 thanks to anonymous commenters for the information. Now before you type in make you may have to modify the “Makefile” to point to where the IDIR = /usr/local/include/bullet and LDIR = /usr/local/lib go to. Alternatively, you could simply bring all of the .a and .h files and make a /lib and /include folder inside of BulletSim accordingly. Open your /bin/OpenSim.ini file with your favorite editor such as nano and add this to the bottom of your file. Like the ODE physics blog this will tell OpenSim where to look for said Physics file. if everything goes well, it should find your new library and not have a horrible crash. The performance between managed and unmanaged are almost the same. They both eat up around %20 processor power of one core on my Banana or Orange Pi. Although the collision matrix seems to be a lot more accurate unmanaged other things like sitting on objects is still a little flakey with bullet. However, if you were to contrast this against the rival physics engine ODE. Bullet seems a little slow and bulky for Metaverse level activity. Perhaps when OpenSim embraces the new bullet 3 libraries with multi-core processing will we expect to see some real results from a physics engine like this one! it seems nicely thought . Do you have any hints for the odroid C2 ? I thought about getting Odroid myself just for the power and eMMC function. But the instructions were tried on multiple ARM based systems and so far has worked alright. The issues I had with compiling bullet came down to using an debian wheezy which was too old. When I used something newer then wheezy it compiled fine and did not crash. so compiling bullet for opensim-0.9.0.0 might be done with 2.86.
seams to work for me. Excellent! I remembered having a lot of problems with the old Opemsim bullet which is why we used that version. But that was a rather long time ago. Tonight we’ll compile the physics 3 and see how it goes. if it works out we’ll update the entry so that we’re up to date on our physics. Super thanks for taking the time on this! Just wanted to let you know that the blog has been updated with the new bullet 3.x. Also the binaries have been updated as well. Thanks for the update and let me know if they come out with a multi-core version of bullet for OpenSim as this would help is tremendously in the ARM processing community. Looks like they archived bullet. I’ve hyperlinked it now so if it moved again WordPress will tell me. Also, In the rare event it disappears completely off of google code I’ll host it locally.